This weekend is our very first (mini) festival at Court Farm Country Park. We'll be there from 10am on Saturday 18th till 5:30pm on Sunday 19th, with lots and lots to do for the kids, including arts/crafts and dressing up with WsMum Karen B, storytime with Gail Richardson, crazy music from Cosmo 4 Kids, martial arts with Sweat FA and arts workshops with b-creative and B&Q Weston. All the usual Court Farm attractions are open to all festival goers too! We'll also have a disco on Saturday night (thanks to Ade from Action Pussycat and WsDad Mark Bradshaw for the equipment). Phew! And We're inviting YOU and, ahem, the kids to add your favourite songs to dance to on our collaborative spotify playlist - just put them on and we'll play them! And remember, we've got the run of the barn, which is huge and UNDER COVER! Camping is, of course, optional - but if you do stay overnight, you get 2 days entry to Court Farm for the price of 1 (camping is only £6 per pitch). Please bring your own food and drink, alcohol is allowed but no fires or BBQ's. * The Blakehay Theatre want to know whether you and the kids would be interested in regualar children's theatre. Please do comment! * In the Grove has been awarded £27k for youth provision and they would like parents and young people's views on how to spend it! A few of us local residents in Weston have set up a Town Team that will make a huge impact right at the heart of our town centre. With a view to getting the full commitment of Town Centre Partnership and Economic Development Team at NSC, we have created the “Weston Community COG” (Centre of Gravity) that is applying for a government grant, under the Portas Town Team Pilot fund. By the end of this week, we aim to apply for a grant that will really make positive changes for the residents and businesses of Weston. The aims and objectives of COG are outlined below. We need the support of as many interested parties as possible and we hope you can see the benefits to you personally and to the wider community in general. Please read through our proposals and, if you agree with all that we want to achieve, a letter of support from local residents and businesses would undoubtedly go a long way to adding gravitas to our application. If you have any suggestions about how we could make our vision even stronger, please do let us know. This is for every member of the local community we really welcome your input. - Build a digital hub bringing together local information, independent business marketing, community bulletin boards and discussion forums, allowing conversations and information sharing to happen online, 24-7. The website will be richly augmented by social media - Twitter, Facebook, Flickr, YouTube/Vimeo, Delicious social bookmarks etc - giving people multiple ways to interact with the project and each other. - Build a mobile app to provide location specific information (GPS and QR code) and enable collaborative marketing. - Work with the Town Centre Partnership to support and facilitate their existing BID aims and objectives which address a number of nuts and bolts issues. - Work with the Council and local businesses to identify training needs and provide courses, mentoring, take- away materials (print and/or download) at little or no cost to independent businesses, community organisations and social enterprise to ensure there's no barrier to access. Pull in existing expertise from Plunkett Foundation, Co-operatives UK, FARMA, ATCP etc. - Build a Centre Of Gravity - a co-operative community enterprise hub and events/arts space - in a prominent high street position, providing enterprise expertise and a space for happy accidents to occur and provide innovative solutions to the problems we face. Please also have a look at our ideas on the Geovation Challenge, here and here and vote for us if you’d like to see our idea get noticed. A strongly supported idea posted on Geovation could bring in anything up to an additional £40K to help run our project so, again, your support would go a long way. We will then share our ideas and a supporting film we are currently working on through dedicated webspace and in the press. We’ll be sure to let you know when this goes live. Q: Where can you get a whole lot of laughs, a lesson in prehistory, a selection of entertaining puppets, a spot of magic and a sing along, all for £6 a ticket? A: At Squashbox Theatre’s Stones and Bones at the Bristol Old Vic. Funnyman Craig Johnson delivers everything and more that his website promises in his 45-minute slot at one of Bristol’s favourite theatres, a show perfectly pitched to children of 5+ years. The audience is invited to use the power of imagination to travel back millions of years to a time when dinosaurs ruled the earth and volcanos raged in Cornwall. From the moment we are introduced to the first of Craig’s alter-egos, Archaeologist Dr Winifred Jones, it becomes clear that his set will be full of delightful little surprises. The young audience remains fully engaged and their chaperones belly laugh as we meet a catalogue of characters, either in the form of Craig himself, one of his puppets or a model. Prehistoric facts are shared with us: did you know that dinosaurs didn’t eat grass? Or that the word Dinosaur means terrible lizard? We learn about stone circles, the earth’s make-up, Arthurian legend, fossilisation, Druidry and … rock music. As the accordion-accompanied rock song prompts rows and rows of little people to bang their heads in rhythm to the music, we know that the content of this production has laid foundations that we, as parents, can build upon. Bristol Dinosaur Project also make a good job of providing free activities for the kids to do before or after the show - fossil making, puzzle solving, book reading, face-painting or simply drawing dinosaur footprints on the canvas-covered tables. * Priory School to accept pupils from 4 years old - what are your views? * The new edition of Mum's Diary is out! 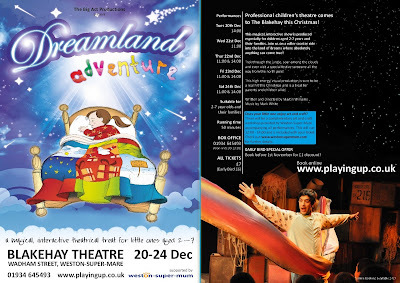 Today, Dreamland Adventure, a pantomime for 2 to 7 year olds, began its five-day residence at the Blakehay Theatre in Wadham Street, Weston-super-Mare. The buzz could be felt all over the Theatre: the festive Brandon Trust-run café serving drinks and snacks, the Blakehay staff dressed in nightwear in honour of the show, while mums, dads, grandmothers and children got arty in the upstairs' studio. The kids made some fabulous pictures to adorn the stage, using a wide range of materials and very little instruction – it’s amazing to see how imaginations go into full swing when we’re given reign to do nothing else but create! After two hours of non-stop making, we headed to the auditorium for the 2pm showing of Dreamland Adventure, an interactive and well-thought out show by The Big Act, a Bristol-based theatre production and training company. Elf Number 1 has to find his way back to the North Pole to get our presents ready or else Christmas will be cancelled and we, the boys and girls, have to help him, shouting, screaming, waving, clapping and singing our way through his myriad adventures. Elf Number 1, gleefully played by Martin Williams, gets the whole audience going as they squeal with delight, joining him on his travels. And on-stage he is accompanied by one of two Weston schoolgirls, Courtnei Danks and Nina Halper. Today, Courtnei was our young actress, who played the part with gusto and professionalism, showing us her dance moves and acting abilities, an inspiration to all young spectators. Holly Sands is fun in her role of jungle native, pirate, sea creature and Elf Number Two, an actress with a sweet, strong singing voice and a command of the stage, particularly in her pirate role, when she invites us all to be her crew. The show is fast-paced and short enough to hold the attention of even the youngest theatre goer. The set is simple but effective and the projected images convincing and easy to understand. There is also snow and a visit from a very special person, as Elf Number 1 finally finds his way home! Dreamland Adventure is showing until Saturday 24th December and Weston-super-Mum will be running free art workshops every day from 12 till 2pm. The kids are welcome to take their pieces home or leave them on the stage for everyone to enjoy and add to. Buy tickets for Dreamland Adventure here or at the Blakehay Theatre Box Office. We were not really sure quite what to expect, coming to a seated theatre performance for under 5’s. On walking into the Brewery theatre, I immediately felt it was a perfect venue for this type of show, being small, intimate, and well lit so that it did not feel dark and threatening in the way other theatre venues might. As the lights began to dim to signal the beginning of the show and my 2 and a half year old daughter began to look perturbed and a little worried, I was pleased to see that the lights were dimmed just enough so that you could still see everything around you and that it was not completely dark, the first of many thoughtful touches. 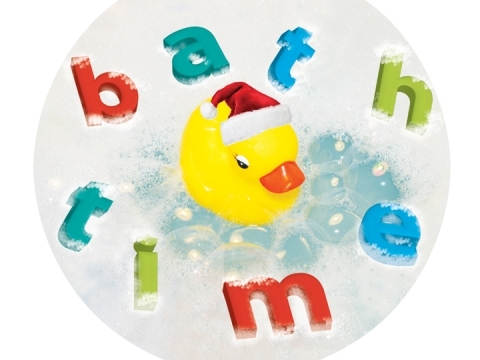 The premise of the show is a familiar one to even the smallest audience members, and revolved around all the fun and silliness that can be had at bath time, with bubble beards, make believe, play, lots of singing, and a seemingly endless stream of rubber ducks! We were introduced to Robin and Matt, the only characters in ‘Bath Time’, and immediately they got on their audiences level with an underpants gag that had the kids squealing with laughter. You know how your 2 year old will often repeat things endlessly because they find it funny or fascinating? The writers and performers of ‘Bath Time’ clearly understood what makes little people tick, with just the right amount of repetition of jokes and themes to draw the smaller members of the audience in, but not too much that the adult members switched off. It was all perfectly silly, and pitched so well at the under 5’s. The older children were able to join in with the audience participation, while the younger ones could appreciate the very visual nature of the production. My girl was initially unsure of quite what was going on and clung somewhat tightly to me, but it didn’t take her long to warm up, and by the time the “magic cupboard” was spilling forth its contents, she was hooked and giggling along with the rest of the audience, adults included. The show lasted 45 minutes which again, was perfectly pitched, any less and you might have felt short changed, any more and my daughter would have got fidgety. We had a ball at The Brewery Theatre, and loved the show. I found myself forgetting I was there because it was theatre aimed at my daughter, as I would have happily sat through it anyway, even if I hadn’t been accompanying a child! ‘Bath Time’ is a perfect introduction to theatre for the under 5’s. I urge you to catch it if you can, great value for a great little show. Bath Time is on at The Brewery Theatre until the 8th of January 2012. On Wednesday night my 6 year old daughter and I were lucky enough to wrap up warm and join another Mummy and her 6 year old to walk through the Christmas lit streets to the 7pm showing of Aladdin at the Playhouse. My 6 year old was very excited, in part because we saw Cinderella at the same venue last Christmas, and she was fondly recalling the silliness of the panto on our journey there. As the show started at 7pm meaning we didn't get home until 10.30pm, I would strongly recommend an earlier performance if you don't want tired and grumpy children the next day! Was it worth it though? Oh yes it was! 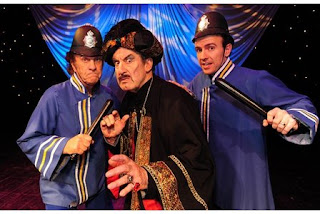 The show began with hissing and booing as Abanazar (John Challis) entered the stage. "We're only booing him because he's pretending aren't we Mummy? He's not really a bad man." The little wise one reassured, we were set up for the rest of the show. And how we very much enjoyed it! Aladdin (Craig Daniel Adams) in particular lit up the stage with his smile and energy. When he was dancing it really felt as if he - and the rest of the cast - were truly enjoying themselves, which helped us to do exactly the same. Some of the singing was particularly enjoyable, especially the operatic wonders from the Emporer (Paul Arden-Griffith) What a voice! And such an unusual twist too. The litte ones enjoyed the versions of modern pop songs the cast belted out for us, and the cultured one in the group was impressed by the Gilbert and Sullivan number. This was panto though - and the highlight for adults and children alike were the VERY silly moments! The policemen (brothers Keith and Ben Simmons who also directed the show) with their word play and disappearing box caused hilarity in the six year old reviewers. But my favourite, without a shadow of a doubt, was the perfectly camp Wishee Washee (Terry Gleed)... "SHOW US YOUR FISHY WISHY!" He did a fantastic job of really getting the audience involved and had my own silly smile spread right across my face as soon as he came back on stage. The panto is a lovely festive treat, and a big thumbs up is deserved to everyone involved in the production. If you want to enjoy a few hours with your family this festive period and have a good old giggle, you could do a lot worse than this.